Looking for a less expensive way to purchase your sweetie’s engagement ring? Have you looked into purchasing the ring online from a company like Whiteflash? Some Whiteflash engagement rings are less expensive than the rings you may get from the traditional brick and mortar stores like Kay Jewelers or Jared’s. 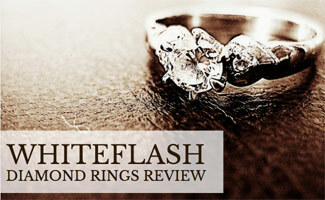 Check out what Whiteflash has to offer and if they have a ring you want to put on someone’s finger. Members of the American Gem Society, which is the most prestigious organization in the jewelry industry. Staff has GIA and AGS credentials. Dedicated photo department for in-house images of each gem. Large selection of designer rings: Tacori, Verragio, Simon G and more. Whiteflash rings vary in price depending on setting and diamond (and a large portion of their inventory are designer rings, which means the pricing is usually set by the brand). When we made our comparisons on prices against other retailers both online and brick and mortar, White Flash jewelry came out in the middle range. On some White Flash diamonds were toward the lower end but with some settings the prices were higher than competitors’. We suggest choosing your own ring and seeing how the price comes out against other companies. Here are some popular Whiteflash competitors for you to compare. Whiteflash occasionally has seasonal coupons, you can visit our dedicated Whiteflash coupon page to see and discuss current offers. Have you been looking at engagement rings online? Trying to figure out if you should buy from Whiteflash, let alone an engagement ring online? Whiteflash has some tips on how to keep your engagement ring looking shiny and sparkly. How Do You Know You’ve Found “the Ring”? Is it within your budget? Have you found the person whom you want to spend forever with? If you answered “yes” to both of these questions, you’re off to a good start! The hard part of finding “the ring” is finding the person you want to put the ring on. In a sea full of fish, it can be difficult to find “the one.” As long as you’ve found the one, you’ll find the ring that displays your love perfectly. If you are interested in other retailers, click here to read our online engagement ring provider comparison. What questions do you have about buying a ring online from Whiteflash? The fact they are Certified ISO 9000 is a HUGE selling point!